In the U.S., amateur tennis players follow the National Tennis Rating Program. This provides clear guidelines for all skill levels, ranging from beginner to advanced and even pro. The system was developed to ensure that players are evenly matched and competing against others of the same skill level. 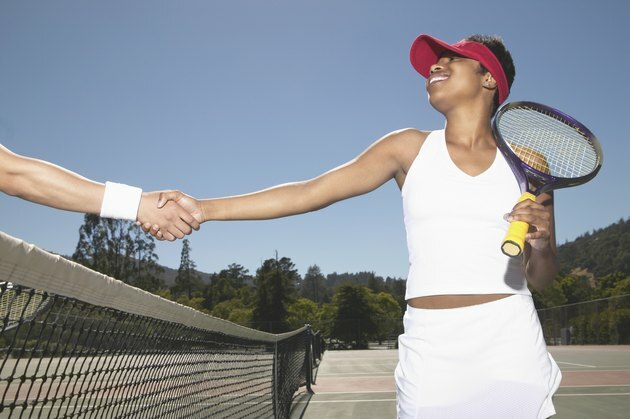 The NTRP rating system is used for all United States Tennis Association leagues, tournaments and activities; it also has been accepted as the official ranking system throughout the country for non-USTA tennis events. Rate your skill in part based on how long you have been playing tennis. Although length of time does not determine a particular level, if you have been playing awhile you most likely are not ranked as a 1.0 or 1.5, which is the rating for a beginner just learning how to hit the ball. If you are able to hit the ball over the net and engage in a short rally, but not necessarily control the direction of your shots and still have trouble getting to the ball in time, you would be ranked a 2.0 or 2.5. Rank yourself at 3.0 if you are able to consistently participate in a rally but your execution of points still needs work. If you are starting to be able to set up points but lack depth and variety, you are most likely ranked at 3.5. If you have confidence in your strokes, direction, control and depth of the ball, and if your repertoire of shots is starting to include lobs, overheads and net play, your level would be 4.0. Jump to the 4.5 level if you are able to confidently get points off of your first serve and place your second serve with accuracy, and if you also are hitting with power and spin, and able to dictate pace. Place your skills at the 5.0 to 5.5 level if your game includes a variety of strategies, power, precision and consistency. And if you are nationally ranked and capable of competing in college, national or international tournaments, you fall at 6.0. If you are a player on the men or women's pro tour, you already know that your skill level is 6.5 or higher.